TeamWin released their custom recovery for the Samsung Galaxy S8 Plus. You can now replace the Samsung stock recovery with the latest TWRP custom recovery. With this recovery, you can easily modify your phone the way you want. Users can now increase the overall performance of the smartphone. To get this, one can install TWRP custom recovery on Galaxy S8 Plus which will then unlock the ability to flash third-party mods, root the phone, and many more. The tutorial is via Download MODE, where you need to use Odin on your computer. We have written the tutorial very carefully so that you don’t get stuck during the installation process. 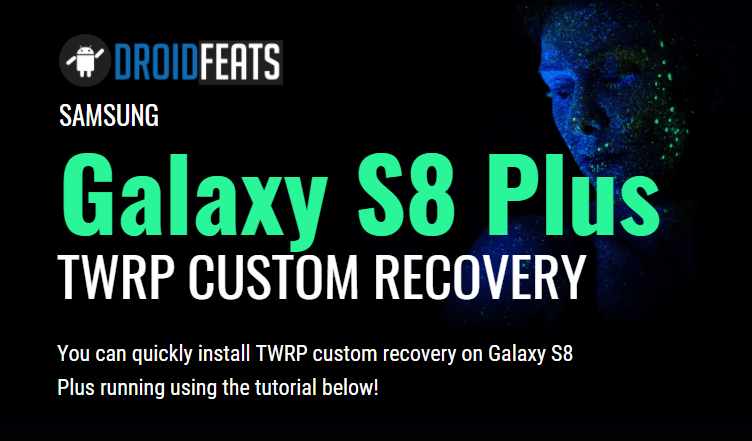 As you continue reading below, we will guide you the entire step-by-step procedure on How to Install TWRP Custom Recovery on Galaxy S8 Plus. If flashing via Odin is not a new task for you, this guide would not be much difficult. We have covered entire step-by-step tutorial so that a new user can perform the flash quickly. But for a safe side, we recommend you to Backup all your important data and apps before moving to the steps. We don’t want you to lose any data, or anything could go wrong unexpectedly. You can quickly install TWRP custom recovery on Galaxy S8 Plus using the tutorial below! After installing this TWRP Custom recovery on Galaxy S8 Plus, you can Flash any Custom ROM of your Choice, Xposed Framework, create a system backup image or restore, and you can easily install system tweaks to upgrade the performance of your phone. Samsung Galaxy S8 Plus got a lot of love from the Developers due to its popularity. The phone will be getting a huge number of custom ROMs based on Android Nougat or Oreo. Most of them can be installed via this TWRP recovery. So, you can enjoy the added benefits of this latest TWRP custom recovery on your phone. We have mentioned full step-by-step instructions on How to install TWRP recovery on Galaxy S8 Plus. If you are entirely new to rooting, flashing a Custom ROM or an Official Firmware, please read the entire tutorial once before actually performing it on your device. ALERT: Make sure you select the appropriate version for your device. Choosing a wrong version may brick down your phone and we will not be responsible for that. Step 9: Once the installation is completed, press and hold your Power + Volume Down +Bixby Button until the device screen turns black. Step 10: Now press and hold Power + Volume Up + Bixby Button together. This will take you into the recovery mode, and you could see the TWRP Custom Recovery interface. Step 11: You can now reboot your device by touching “Reboot now” option in TWRP. Hurray! Your Galaxy S8 Plus should have got TWRP Custom recovery installed by now. You can try out some of the best Custom ROM from our list on your Galaxy S8 Plus. NOTE: Your Galaxy S8 Plus must be rooted to perform this. Does it work for sprint SM G955U? Yes, it works, but make sure to download the correct version of TWRP recovery from the given links before starting the tutorial.